Not happy with just taunting us with the new 2010 Chevy Cruze going on sale a year earlier in Europe than in the US, GM has now fully unveiled the World Touring Car Championship Chevy Cruze, all dolled up for serious action. The racing Cruze replaces the Chevrolet Lacetti as GM's WTCC corporate racer and will be driven by a 2.0 liter four cylinder and piloted by Brit racer Rob Huff, Swizerlander Alain Menu and Italian Nicola Larini. The rough part of this whole story is the pun-tastic headline GM uses in their press release. An audible groaner below. CRUZE-ING TO VICTORY? * Chevrolet unveils new WTCC contender * 2009 car based on new Cruze global car * British driver Rob Huff continues Chevrolet involvement With a new global car on the way for 2009, the World Touring Car Championship is the perfect platform for Chevrolet to put its latest model in the public eye. 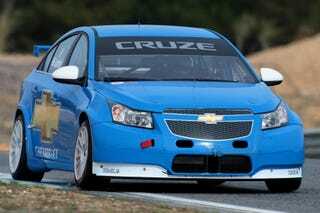 This is the new Cruze WTCC car, which replaces the successful Lacetti as Chevrolet’s contender in the 2009 series. Powered by a 2.0-litre petrol engine, the WTCC Cruze has a hard act to follow, as the Lacetti won its final two outings for Chevrolet in Macau. But Chevrolet’s drivers are confident that the new car will be a top performer in the series, which has gained global recognition as one of the most exciting tin-top series since its inception in 2005. British driver Rob Huff (28) from Newmarket, Suffolk, who has been with Chevrolet since it debuted in World Touring Cars said: “The Cruze is a great car and feels fast straight out of the box. We are obviously still at the very early stages of development but already I can feel how much better it handles and what an advantage the car’s wider track will be in a race environment.’ Rob will be joined in 2009 by Swiss racer Alain Menu and Italian Nicola Larini. All three drivers also drove for Chevrolet in 2008. The cars will be prepared for Chevrolet once again by RML Motorsport. The Wellingborough, Northants, based company has a history of motorsport involvement with Chevrolet’s parent company, General Motors, and has looked after Chevrolet’s WTCC involvement since 2005. The Chevrolet Cruze, on which the 2009 WTCC car is based, will go on sale in the UK during the first half of next year, and will be sold in over 130 countries worldwide. It is one of Chevrolet’s most important new models ever, as it clearly illustrates a new level of styling and quality for the brand, both in Europe and in the USA. The car made its public debut to much acclaim at the Paris Motor Show in October.